With increasing attention given by governments and policy makers to children’s transition to school, and the associated need for educators, families and communities to be supported in the process, changes are often required to existing structures and pedagogy. This book is framed around the notion of transition as a time of change for those involved in the transition process and as a time for reconceptualising beliefs, policy and practice. how policy, curriculum and pedagogy are conceived and implemented. Readers will be informed about current practices and issues arising out of research in Europe, Scandinavia, the United Kingdom and Australia and will be stimulated to consider how they can change their own transition beliefs, policies and practices. 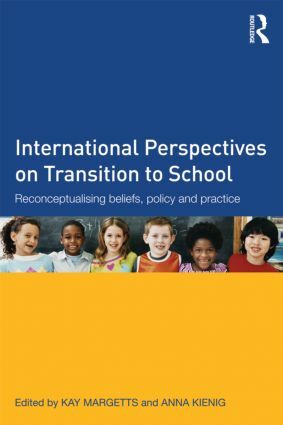 Transition to school: Contemporary Perspectives and Change is essential reading for researchers and educators and anyone wanting to know more about the transition to school and how to support young children, their families and schools. Kay Margetts is Associate Professor in Early Childhood Studies, and Director of International Baccalaureate Programs in the Melbourne Graduate School of Education at the University of Melbourne, Australia. Anna Kienig is Assistant Professor in Developmental Psychology, Deputy Dean for Student Affairs and Coordinator of International Programs (Socrates/Erasmus) at the University of Bialystock, Poland.